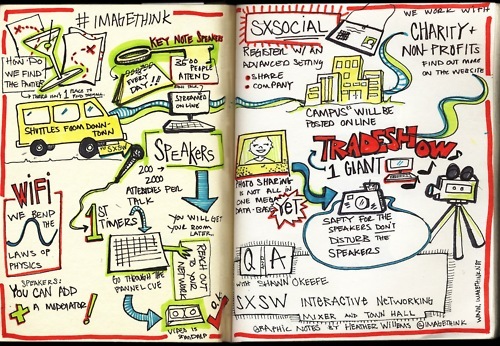 Not able to attend SXSW (the South by SouthWest conference), I have to live vicariously through the tweets, blog posts, slideshares, and other conference notes from attendees who happen to be among my social media contacts. So, this set of hand-drawn notes by ad agency Ogilvy appeals to me on several angles. First, it’s visual. Colorful. Image-based, more than text-based content. Second, it’s good for business. Clever that this agency differentiated itself from others, the illustrations open potential business opportunities for Ogilvy, simply because presenters and followers who request a free 11×17″ print might linger, browse, and perhaps do business with Ogilvy. Third, it’s cleverly different. Unlike the presentations posted on other sites, notes posted on blogs, and photos and tweets, this visualization of the content got my attention. Prepare to be visually fascinated!